As an American Muslim woman, much of my work is inspired by the issues relating to the status of women. I find it incredible that despite the honor given to women in the Qur'an and the prophetic traditions, many contemporary Islamic societies still categorically mistreat and subjugate women. Misogynists from various faiths have found ways to justify their actions by perverting religious texts and traditions. "In the Defense of Eve" addresses one such tradition, which is the story of Adam and Eve eating from the Tree of Knowledge. In some interpretations, it was Eve who ate from the Tree of Knowledge first; she then seduced Adam to do the same. From this act of disobedience mankind was cast out from heaven, and all people carry the stain of original sin. This interpretation has led to the marginalization of the female voice and has provided justification for the abuse and subjugation of women. However, the story as related in the Qur'an states that both Adam and Eve disobeyed God's command simultaneously, that they repented, and that God forgave them both for their mistake. The narrative of mutual responsibility, acts of repentance, and divine forgiveness resonates deeply with me, and was the impetus behind my painting. 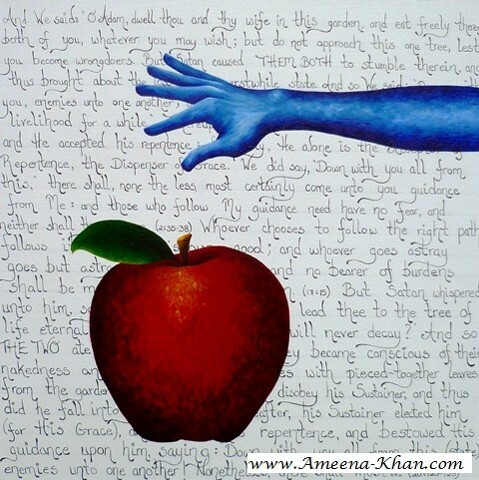 I chose to represent the story with a woman's hand dropping a very large apple to symbolize the release of the burden of guilt or responsibility. The background of the work contains some of the Qur'anic verses referencing the story of Adam and Eve.